Holy smokes! Talk about having a hard time getting back into a normal routine! I think I'm still in holiday mode because my brain has seriously been AWOL since the beginning of the holidays. Hello Brain? Yeah, could you please come back? I need you! Anyhoo, instead of having a typical shop update, I decided to have a post-New Years As Is Sale! What does that mean? Basically, the bags that I think are flawed, will be on sale for up to 40% off the originally price! 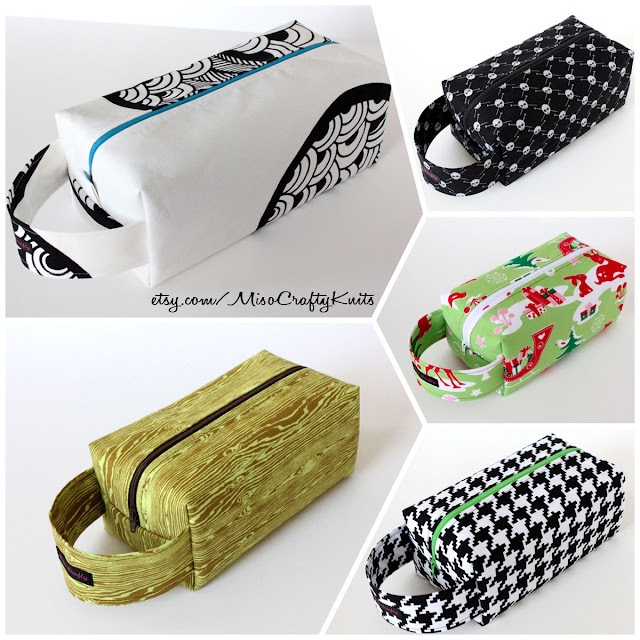 So if you think you can live with using a project bag that has a slight, barely noticeable pucker in a seam, or a bag that has a slightly off-centered zipper, then you can score a project bag on the cheap! The sale started yesterday (and it's totally my bad for not saying anything 'til now), and I'm sincerely sorry if there's not much left. I rarely do 'As Is' sales (usually once or twice a year), and sometimes I'm sneaky and will throw in a non-flawed bag on sale into the mix...just for fun! I'm planning on listing a few more bags up for sale throughout the week, so check back often!